Silverweed (Potentilla Anserina) is known as other names: Argentine, Cramp weed, Goosewort, Moon Grass, Silverweed, Wild Tansy, Prince's Feathers, Trailing Tansy, Wild Agrimony, Goosewort, Silvery Cinquefoil, Goose Tansy, More Grass, Wild Agrimony. The silverweed flower is yellow, measures up to 2 centimetres in diametre and has five petals. (There are some flowers reported to have six petals.) The flower grows on a leafless stalk and blooms between June and September. Silverweed flowers are insect pollinated as well as self-pollinated as they are hermaphrodite. This plant grows well in many areas throughout North America, Europe, Australia, New Zealand, Asia, South America and in parts of Africa. Although silverweed can grow in arid, grassy areas, it is also found in meadows and by wet sandy shores. Depending on location, this edible plant has also been found in ditches as well as in moist calcareous (chalky) soils. Silverweed propagates by sending out its runners. The roots of these long runners go under the earth and produce leaves. When the mother plant dies or withers away, new parts which have grown the length of the runners turn out to be separate plants. In effect, this method of propagation enables the herb to resist grazing by various animals. The Silverweed is a favourite food of cattle, horses, goats, pigs and geese. Only sheep decline it. An herbal tea prepared with the underground silverweed roots is employed to facilitate childbirth as well as in the form of antispasmodic agent to cure diarrhea. Long back, people also placed the herb inside their shoes to soak up sweat. In earlier times, people thought silverweed to be effective for treating epilepsy and also believed that it possessed the aptitude to protect against evil spirits and witches. A strong decoction has been used for mouth ulcers, lose teeth, bleeding gums and so on. Native Americans used the roots in a tisane to speed up labour in childbirth and as an antispasmodic for diarrhoea. Silverweed is mainly regarded as an astringent herb and good for a tonic. 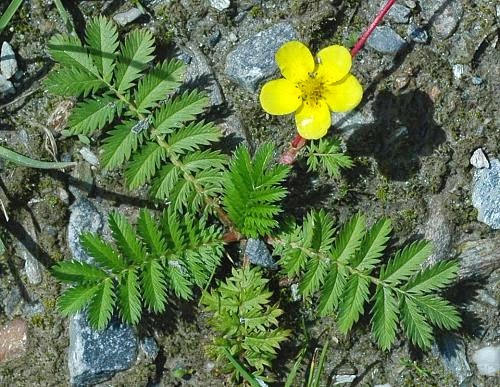 The combination of astringent tannins and antispasmodic action (which is possibly due to glycosides) makes silverweed especially useful for treating diarrhea and ulcerative colitis, since the tannins have antibacterial action and help to heal the intestines, while the antispasmodic effect reduces intestinal contractions. For several centuries, Native American Indians, Europeans and even the Chinese have been consuming silverweed rootstock in different forms - raw, boiled and roasted. The rootstock of silverweed has helped people in different regions to survive in times when no other food was available. During the last few decades, Tibet has been reeling under the problem, particularly among children, and the root of silverweed, which is also known as ‘droma' in the region, might be a possible help in solving this problem in the mountainous region. In effect, silverweed is found growing on plains all over Tibet. Earlier, the Tibetans harvested droma (silverweed), pounded the dried herb and provided it as a food for their children. Anyone visiting the market places in Nepal (where the herb is reaped from the high plateaus) and Tibet, they will find bundles of silverweed rootstock (droma). In effect, a nutrient study of droma has shown that the amino acid content of the plant's rootstock is equivalent to that of barley - a staple of the Tibetans. As barley flour is mixed in tea and provided as a food to children in Tibet from a very tender age, droma too may be included in the mixture to make it a complete protein meal. The dried and powdered leaves have been successfully administered in ague: the more astringent roots have been given in powder in doses of a scruple and upwards. The decoction has been used for ulcers in the mouth, relaxation of the uvula, spongy gums and for fixing loose teeth, also for toothache and preserving the gums from scurvy. A small portion of silverweed put inside the shoe may help to avoid getting blisters. On the other hand, an infusion prepared with silverweed leaves is a wonderful lotion for cleansing the skin and it is also employed cosmetically in the form of a calming ointment for treating reddened skin as well as for nurturing the delicate skins of infants. 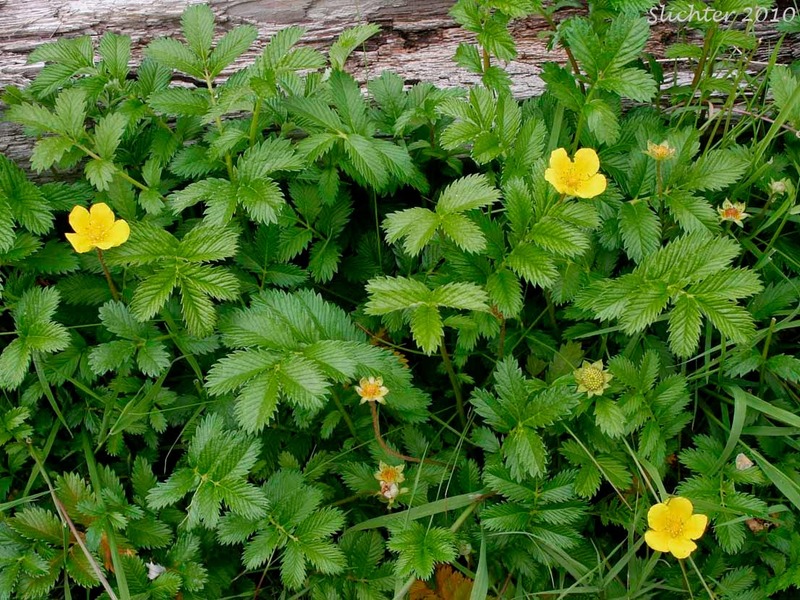 In the highlands, people considered the infusion prepared with silverweed leaves to help in preventing or removing freckles and sun-tan in those days when women believed that it was beneficial to avoid sun tans. They steeped the leaves of the herb in wine vinegar and occasionally used them for such cosmetic purposes. Using alum in the form of an astringent (mordant), silverweed produces a light yellow colorant. In addition, Blackfoot Indians in North America have long used the runners of silverweed in the form of bindings for leggings, blankets and other things. In Chinese medicine, Potentilla chinensis or Potentilla discolor is called fanbaicao; it is a commonly used remedy for diarrhea, especially if accompanied by blood discharge; it is also given for other hemorrhages, including menstrual bleeding and blood in the urine due to infection or gravel. 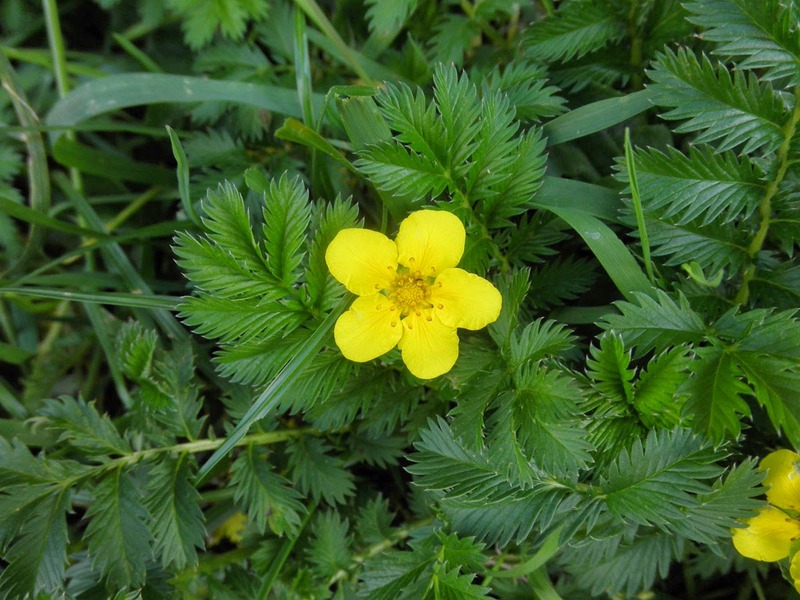 Silverweed has often been used for treating menstrual cramps. In addition, as the herb encloses a high level of tannins, it is effective in treating sore throats, bleeding as well as oral and skin ulcerations. The whole silverweed herb possesses antispasmodic, diuretic, gently astringent, tonic, odontalgic (any medication that provides relief from toothache) and haemostatic (any medicine that helps to stop bleeding) properties. Silverweed is used topically to cure aching, distended or extremely sweaty feet. A potent infusion prepared with the leaves of silverweed is employed to regulate hemorrhage from piles. The herb is also used in the form of a powder externally for treating hemorrhoids and ulcers, while when the whole battered herb is placed on top of the excruciating area, it works as a local pain-reliever. Silverweed can upset a sensitive stomach. In some the herb may lead to skin irritation due to its astringent action. Silverweed should be avoided in pregnant and breastfeeding women.